To bottle or not to bottle? That is the question. While kegs are fun to have at parties and are practical for serving large crowds, they may not always be the best option. Keeping your keg cold can be an expensive initial investment and dramatically lacks mobility. Bottling beer is much more affordable and is more easily transported. If you’re thinking about bottling, it will be essential to choose the correct capping machine to serve your needs. Bottle capping machines, or bottle cappers, are designed to apply traditional crown caps and create a tight long lasting seal that won’t sacrifice the integrity of your work during bottle fermentation, shelf life, and transport. These caps are applied to bottles with a ½ in lip without threading. Threaded bottles and screw caps are a convenient option, but crown caps provide a much better seal. It is crucial to have a good seal on your bottles because this will prevent your beer from spoiling. Loose and crooked caps will cause carbonation leaks and can cause off flavors in your brew. This makes traditional caps the only viable choice. There are many options when considering which beer bottle capper will be best for you. 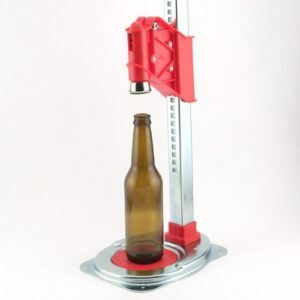 The two most common types of beer cappers are hand bottle cappers and bench bottle cappers. Each bottle capping tool has its pros and cons, so we have highlighted a few of our favorite cappers for beer enthusiasts. 5 What’s the Best Beer Bottle Capper? 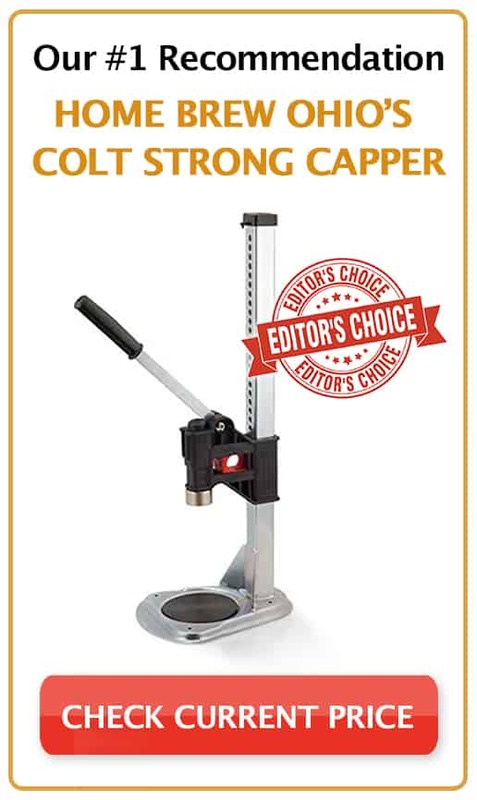 Home Brew Ohio’s Colt Strong Bench Capper is essentially an upgraded version of the Ferrari Super Agata. 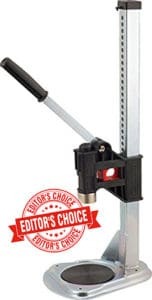 This reinforced bench bottle capper is designed to be used with 26 mm caps, is adjustable for different bottle sizes, and capable of being mounted to your workstation. The base is welded, and its rubber lever grip makes it much easier on your hands than the hard plastic of the Ferrari Super Agata. It is very sturdy with few plastic components, making it a better option for printed caps and large batches. This, with its solid steel capping bell, makes it a smart investment and my personal favorite. If you are considering bottling more than 5 gallons of beer, you may want to forget about the hand capper and upgrade to a bench capper. Bench cappers are more plausible for frequent bottling and can save you a lot of time. The adjustable Ferrari Super Agata Bench Capper is an excellent bottle capper machine for fast and easy crown capping, which makes it great when using custom bottle caps. Its non-slip bottle rest, spring-loaded lever, and magnetic bell allow you to keep up the pace without skipping a beat. And unlike many hand cappers, the Super Agata does not leave a dimple in the cap, making it a better choice for printed caps. The one downside of this capper is that the plastic components holding the bell and piston tend to bend over time. Don’t let the plastic and inexpensive price of this capper fool you. 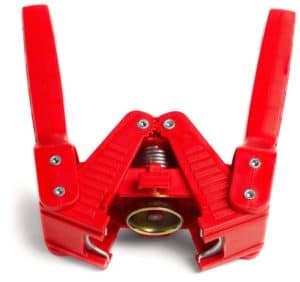 Coming in a flashy Ferrari red, the Red Baron Bottle Capper is a lightweight and very durable hand capper. 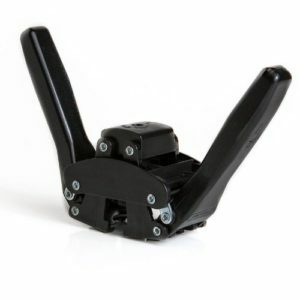 It is designed with spring-loaded arms, a 26 mm magnetic capper, and a self-stopping crimping bell. It is easy to use as it provides a very tight seal without requiring much strength. All you have to do is load the cap, place the capper on top of the bottle, and pull the levers down. You will be able to feel when the cap has been sealed and can be confident that your beer won’t spoil. 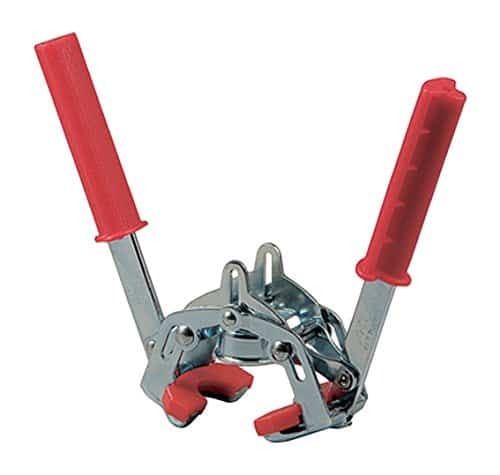 The Universal Capper’s OJ-NDV7-41AH Rigamonti Capper is also a very popular hand capper. This crown capper is available in two different models. The Art 108 is designed for caps that are 28mm and the Art 105 is designed for 26mm. Both models are constructed from metal rather than plastic, making them more durable and sturdy than their plastic capper counterparts. This Rigamonti Capper also has slightly longer arms than the Red Barron manual bottle capper, providing slightly more leverage and making it easier to bottle multiple gallons of beer at once. Although this manual capper does a great job protecting and sealing your bottles, it does leave a small depression in the center of the cap . It won’t cause any damage to your beer, but I consider this to be a small cosmetic defect. The Black Beauty Bottle Capper is a solid hand capper and another great option for beginner brewers. It is made of plastic with metal teeth and hinges. It is specifically designed for 26mm caps and has a smooth action. When depressing your caps, try to apply only the required pressure. This will ensure that you don’t crack any of your bottles. Also, to avoid any depressions in the cap, try removing the bottle before returning the arms to their natural resting positions. The integrity of this product certainly contributes to its longer lifespan than other popular DIY hand cappers. This is another great option for beginner brewers. If you still aren’t sure whether to go the manual route with a hand capper or with a bench capper, you should consider the amount of beer you plan on bottling and how much money you are willing to spend. Bench cappers are much faster and provide more ease of use. This will be much more convenient when bottling 50 or more beers at a time. They are also typically mountable which makes for a smooth assembly line. When it comes down to it, hand cappers and bench cappers are both great options for bottling beer. Both enable you to properly seal your beers, and both are able to serve your diverse bottling needs. Choosing one bottle capping machine over another is just a matter of personal preference and how much volume you will be bottling. But, if you want to know 52 Brews recommendation, then read on. What’s the Best Beer Bottle Capper? If you decide to start out bottling with one of the hand cappers, we would recommend going with the Red Baron. It is durable and is a good option if you start getting into bottle fermenting your brews. However, if you don’t mind spending a little more, we would go with the Home Brew Ohio’s Colt Strong Bench Capper. It is going to make it a lot easier to bottle many beers in a single sitting, and is an excellent option if you are going to start bottling on a regular basis. Plus, I simply feel like it gets the best, snug fit… which means clean tasting beer.